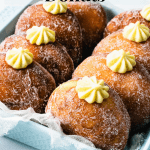 I made these Bavarian Cream Donuts to join the Oktoberfest Bash hosted by Milena from the Craft Beering. Together with some of my fellow bloggers, we are each bringing one Oktoberfest recipe to the party. 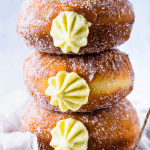 So, these Bavarian Cream Donuts take me all the way back to a happy place in my childhood. I am not German or have a German family, but I grew up eating Bavarian Cream Donuts. They just went by a different name. They were called: Sonho de padaria (translation “bakery dream”). Back in Brazil, my Portuguese grandmother had a bakery with her siblings and my grandpa. And this was one of the staples in their shelves. They had their bakery for almost 50 years! The bakery is still there, under a different owner. But it’s where I grew up, and I hold dear memories of that place. And of course, its food. My grandma was the baker. She made some mean Pastry Cream filled donuts. The difference is that they used to cut the donut in half to fill it with the pastry cream. And didn’t add vanilla bean to their filling either. Actually I am not even sure if the original Bavarian recipe uses vanilla bean, but I am one for modifications, adaptations, changes, improvements. And I believe that the vanilla bean seeds in the pastry cream just bring the Bavarian Cream Donuts to a whole new level! You are going to make the donut dough a day before you intend to make your donuts. The next day, remove the dough from the fridge after resting overnight, and start by rolling it out til about 1/2 inch thick. 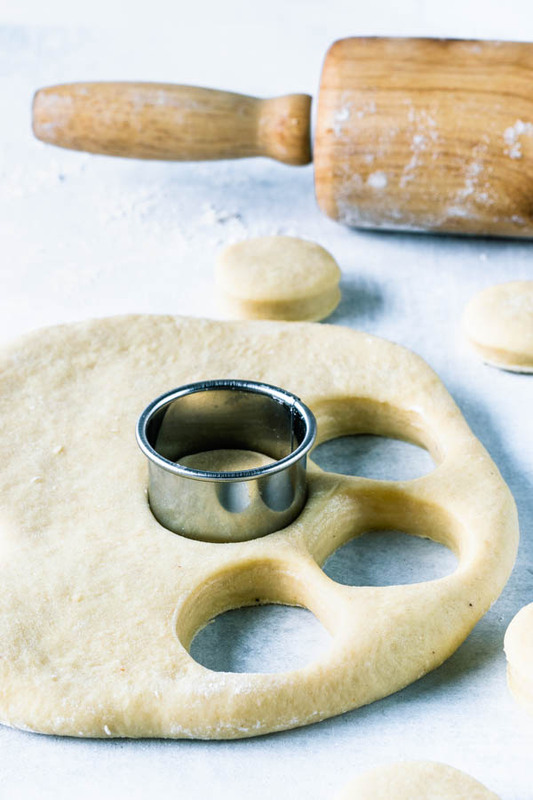 Cut it into circles with a cookie cutter . I used a 3 1/2″ cutter . Fry donuts. Immediately coat them in granulated sugar. The donuts have to be hot so this way the granulated sugar will stick to it. 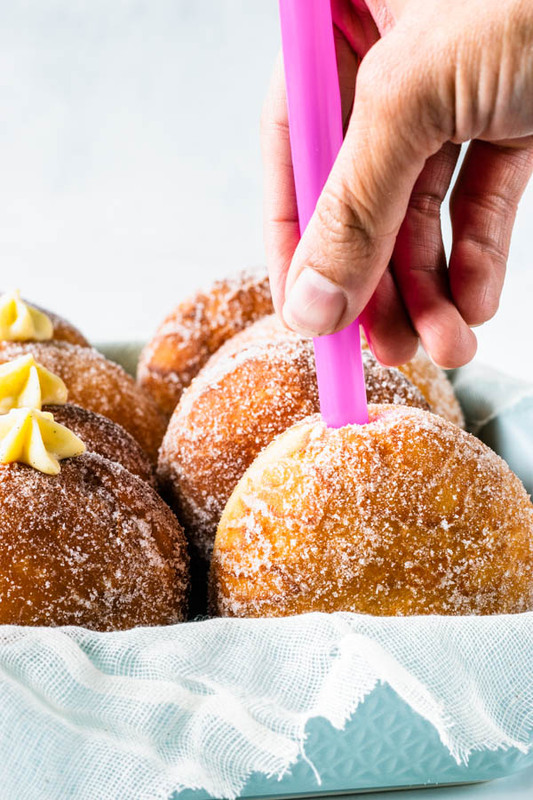 Once donuts have cooled down, you can either slice them in half and fill them, or you can poke a hole with a thick straw on top of the donuts. And then fill each donut with the Vanilla Bean Pastry Cream. This recipe makes a lot of donuts, probably about 20 of them. I made 12 into large donuts and fried the rest as donut holes. I used a small 1 inch cutter to cut the donut holes. And coated them in a cinnamon and sugar mixture when they came out of the fryer. They were devoured in 0.7 seconds by my husband and 2 year old son Luke. Anyway, this is the best donut dough I’ve ever made. I am so happy and proud to bring this recipe to you today. And I also wanted to show you a picture of the inside of the Bavarian Cream Donuts. Thanks for reading guys, and check out the other posts by my fellow bloggers with lots of Oktoberfest recipes! 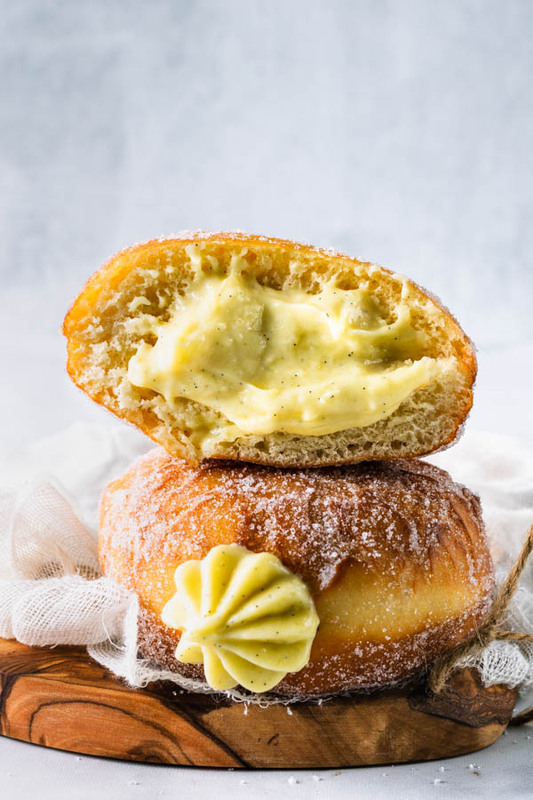 Bavarian Cream Donuts are filled with a vanilla bean pastry cream. Start by warming up the milk until lukewarm, about 90-100F. Don’t go hotter than this or you may kill the yeast. Add sugar and mix to dissolve. Add yeast. Now you may add the flour and salt. Add eggs one at a time, mixing with a spatula or the paddle attachment of a stand mixer. Knead dough on medium-low for about 1 minute. Add unsalted butter by the tablespoon with the mixer on. Let the mixer knead the dough for quite some time. I recommend using a stand mixer to do this. If you don’t have one or don’t want to use one, that’s ok but you may need to work your arms a little bit. Use a spatula and simply try to incorporate the butter into the dough by mixing as vigorously as you can. Regardless if you are using a mixer, or mixing by hand, if after 5 minutes of kneading, the dough is too sticky, add a bit more flour. You may have to add up to 1/4 cup of flour to the dough. Knead for another 4 minutes or so. Once dough is smooth, transfer it to a large bowl, lightly oiled. Cover with plastic wrap and let the dough rest in the fridge overnight, or at least for 8 hours. 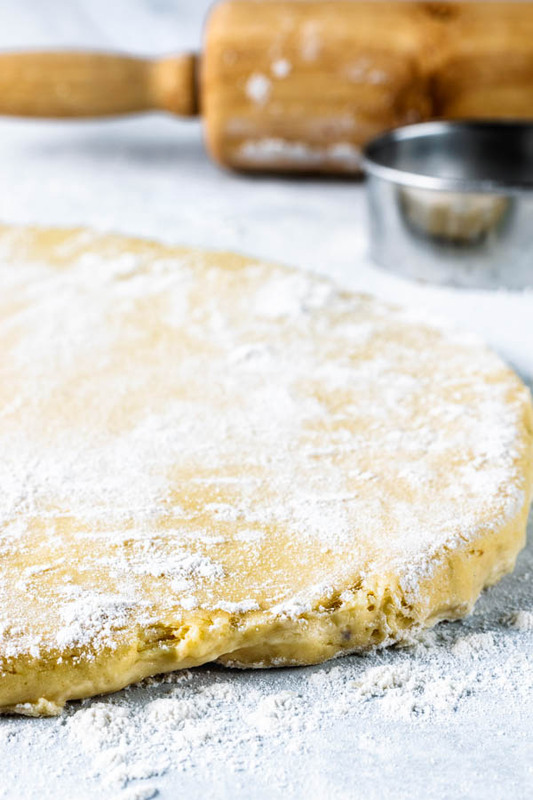 Remove dough from the fridge, transfer to a lightly floured surface, using your hands or a rolling pin, gently roll the dough out into a circle that will be about 1/2” thick. 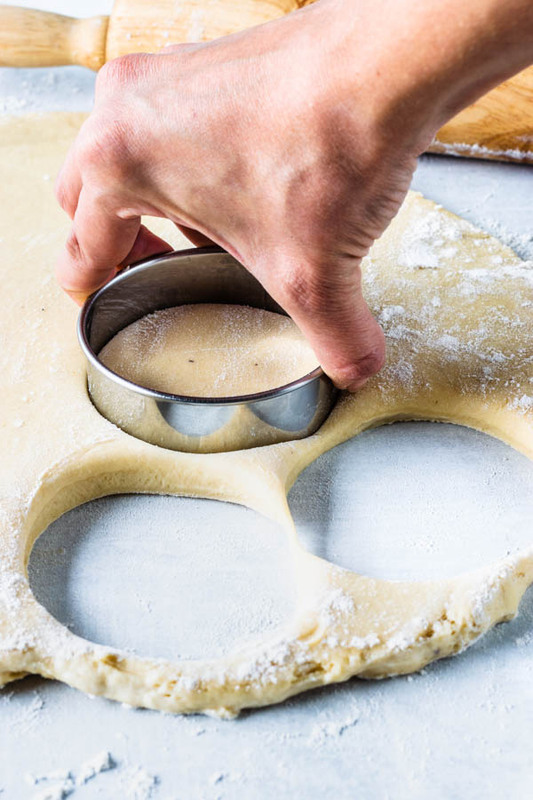 If you use your hands, simply pat the dough as gently pushing your fingers away, in order to open up the dough. Using a circle cutter, cut circles out of the dough. I used a 3 1/2” cutter. 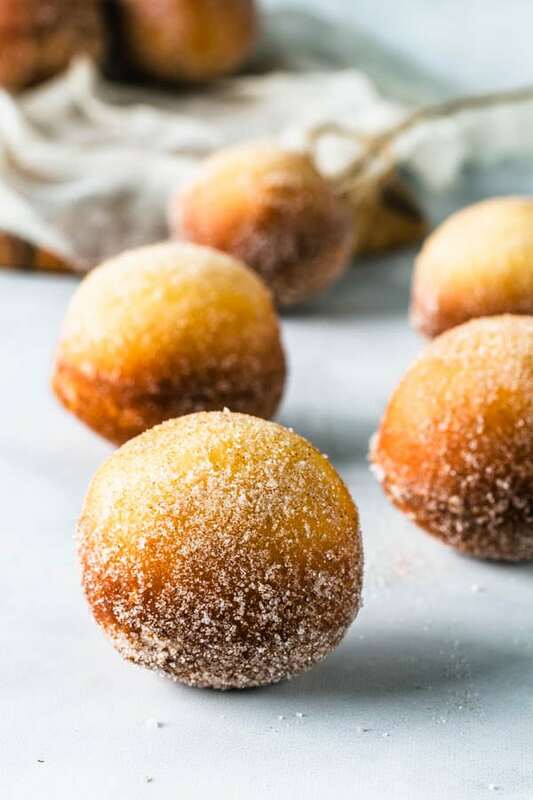 Set donuts on top of a tray lined with parchment paper or a silicon mat. You want to leave some room between the donuts because they will rise slightly. Repeat with remaining dough. Just be careful not to keep kneading the dough too much as you re-roll it, or the dough might become tough and chewy. I made 12 large donuts and made the rest into small donut holes. Feel free to make more of the large ones if you don’t want any donut holes. 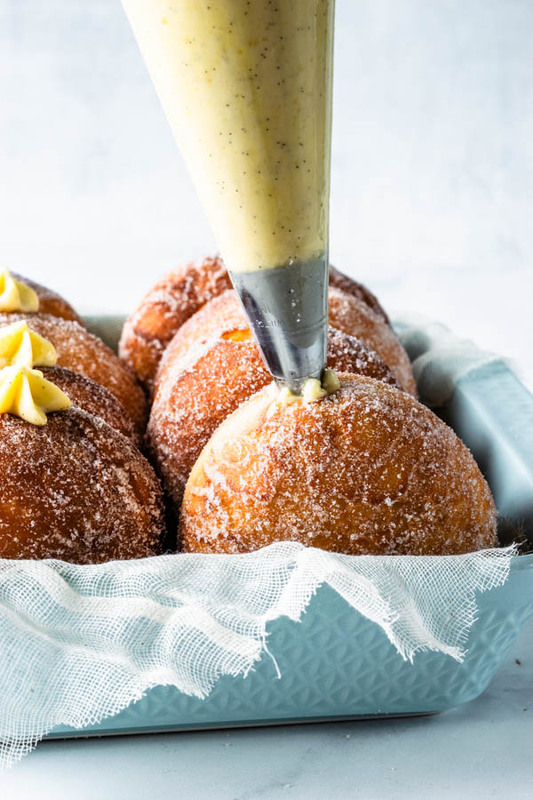 The recipe for the pastry cream will be enough to fill about 20 donuts, depending on how generous you are with your filling. Cover donuts with a clean kitchen towel or plastic wrap. Let them rest for about 1 hour to come to room temperature and rise a little bit. I usually like to make my vanilla bean pastry cream a day before, when I make the donut dough. So this way it has time to firm up in the fridge. Start by bringing split vanilla bean, seeds, and milk in a large pan to almost a boil over medium heat. Once you see the first bubbles emerging, turn the heat off. Set pan aside to infuse the flavor a little bit. Some people even like to cover their pan and let the mixture infuse for 20 minutes or so, which is totally something I am all for. Whisk egg yolks and sugar in a bowl, until pale in color. If you have infused your milk and vanilla for a long time, you may have to re-heat it again. If the temperature is below lukewarm, just bring it to almost a boil again. Start by pouring about 1/4 cup of the milk mixture over eggs, while whisking. Add another 1/4 cup and whisk. Do this until the milk has all been incorporated. This is when I discard the vanilla bean. Place mixture back in the pan, over medium heat, stirring without stopping, bring to a boil. Lower the heat to low, don’t stop stirring as it cooks. You are going to cook this custard for just a couple of minutes, until it’s thick and smooth. In the beginning it will seem like it’s scrambling, but you have to keep the heat extremely low, and don’t stop stirring. Turn the oven off once mixture is smooth. Place mixture in a bowl and set aside. Let it rest on top of the counter for 5 minutes. Add vanilla. Stir until combined. Place plastic wrap directly on the surface of the custard so it won’t form a skin as it cools down. Keep it refrigerated until ready to use, and I recommend refrigerating it for at least 5 hours before using it. Place oil in a large frying pan. Over medium high heat, you can heat the oil until 350F. Add donuts in small batches and fry about 1 minute on each side. Remove to a cookie rack, or another place where it can let the excess oil drip. 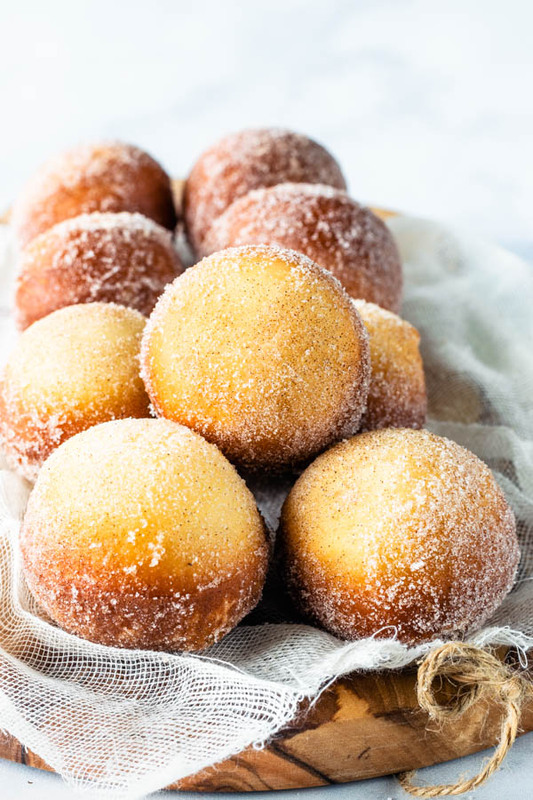 Coat donuts in sugar as soon as possible, because they have to be warm to make the sugar stick in them. Wait for donuts to cool down. Using a straw, poke a whole on the side of each donut. Place chilled Bavarian Cream in a pastry bag, and pipe the filling in the center of each donut. 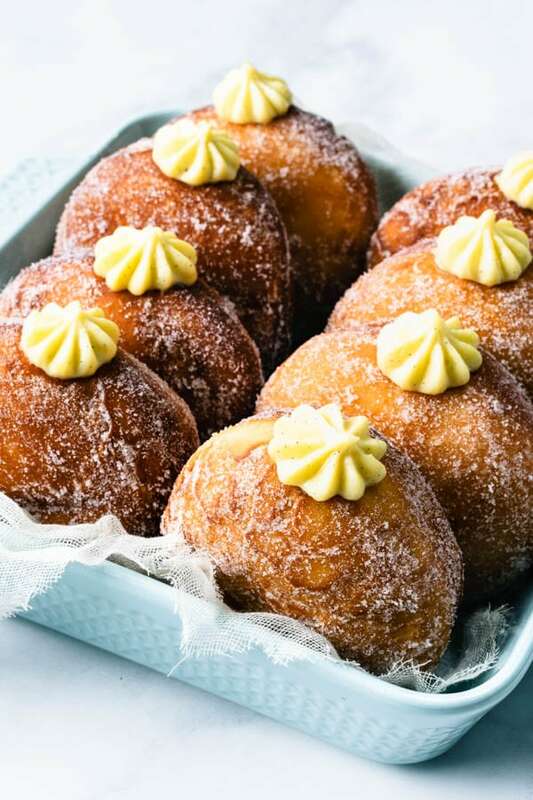 These donuts are best if consumed on the day they are made, preferably within a few hours. Specially if they are already filled with the cream. Esse é um doce irresistível!!!!! Oh myyyy! These look divine! Wish you could send me a dozen! Make that a baker’s dozen! 😉 Pinned! No wonder they were devoured!! These look AMAZING! With your tutorial I am pretty sure even I can put together a batch, may not look as pretty, I am sure I will mess up the piping of the cream inside the donuts, but will be delicious. Absolutely a bakery dream…Pinning everywhere! 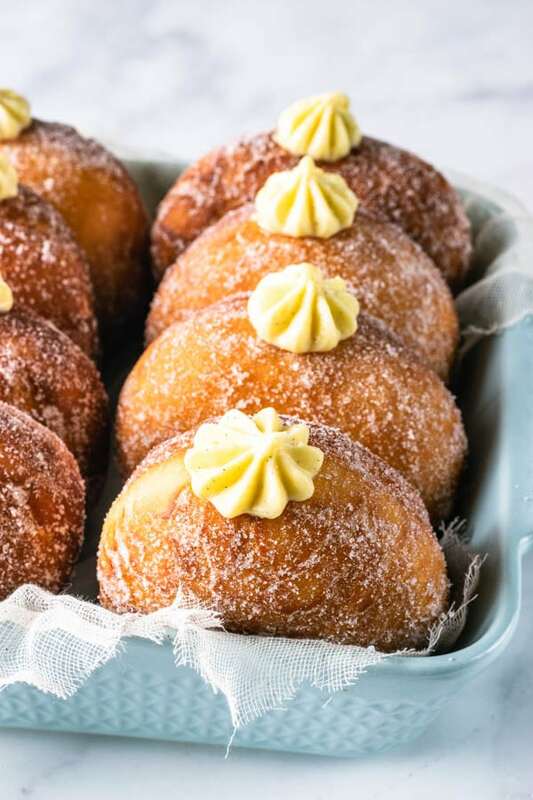 Oh wow…these look like donut perfection! Can I come over for breakfast?!?! I’ll bring beer or coffee….or both ahaha. Happy Oktoberfest 🙂 PINNING!! OMG! donuts made from scratch!! I’m IN! I always tell my husband if the donuts are made from scratch, especially like this, they always worth the calories ha..ha..! AMAZING and so beautifully captured too! ohemgeee! These look amazing especially that vanilla bean filling. Ive never made donuts before but Im pinning these for when I do. 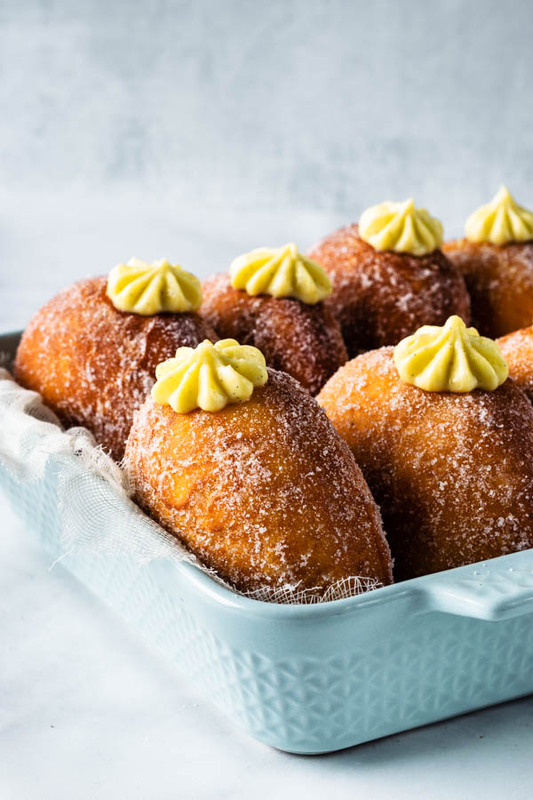 These seriously look like the best doughnuts and such a fun kitchen project! 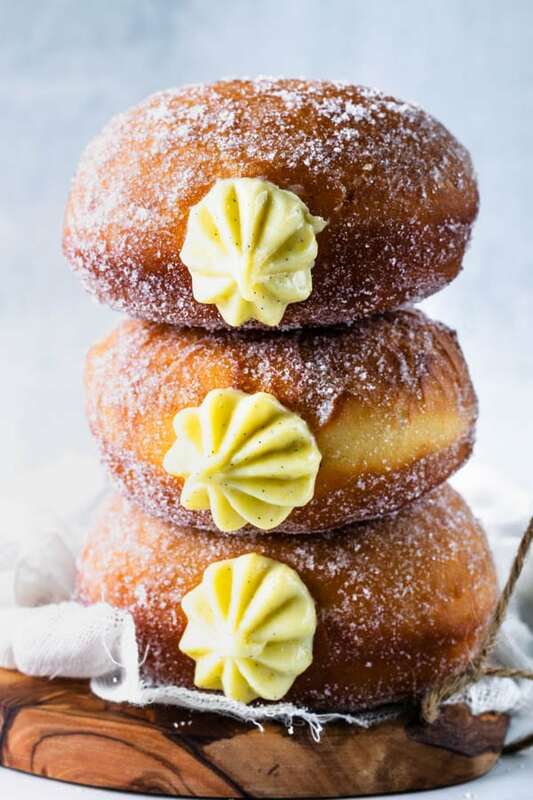 I always love a good cream-filled doughnut, so I’m super excited to make these. Prost! I can’t tell you how badly I want one (or three) of these right now. That filling alone looks incredible! Donut even mess around! 😉 I could eat about a dozen of these. So good! Oh they look absolutely sinful!! Thank you for pointing it out. I just removed that. Initially I had a step where I would whip the heavy cream and fold it with the already chilled pastry cream right before piping, which you can still do if you want a lighter filling. However, I like my filling to be on the thicker side, so I started skipping that step. But you can experiment with it if you want to. Simply whip 5 tablespoons of heavy cream and fold it with the pastry cream before piping in the donuts. Thank you again for pointing it out to me!! I appreciate it. Have a great day!! Ohhh!! that was a huge typo on my end!! I apologize about that! It’s still 1/4 cup of flour, but instead of 318 grams it’s 31.75 grams, or 1.12 oz. Thank you so very much for bringing to my attention!! I am happy to hear you thought they tasted great!! Thank you so much for making my recipe and reporting back to me!! I appreciate your support and thank you for reading my blog! You’re awesome! Have a great day! !